Up to this point I thought art was something you have a gift for and something you do just to show everyone how well you can do something you enjoy. 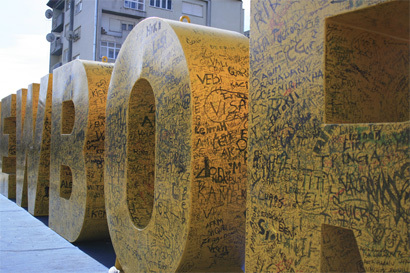 However, that all changed for me less than two weeks ago, after my lovely country of Kosova declared its Independence. We — a team of about 20 creative individuals and another 100 technicians, lead by Fisnik Ismaili — helped give birth to a massive newborn. 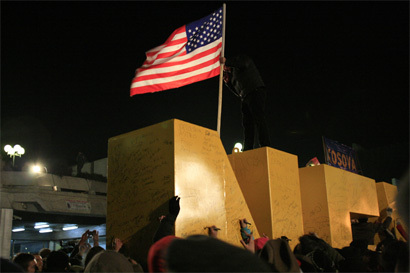 More specifically, we created a 24-meter-long by 3-meter-high (78-feet by 9-feet) structure weighing close to nine tons, to mark our most precious day in history. NEWBORN awaits its unveiling. Photo by Yll Vuqiterna. NEWBORN was made out of iron frames all wrapped around with 4mm-thick (eighth of an inch) metal-sheets. Afterwards this beauty was painted nicely in yellow resembling the color of the stars in Europa’s flag. This sculpture was created for a specific time and place, and for a specific reason. There was no art history connotation attached to it. There was no special artist or talent doing this. Above all, there was no built-up hoopla surrounding it. It was a plain work of heArt that became an icon and gave a country a nickname: NEWBORN. NEWBORN was brought to life by few artists who wanted to mark the Independence Day of Kosova in a specific way. A total of ten days were used from conception to the birth of NEWBORN. Around-the-clock hard labor was utilized to make this art piece as successful as it can be. Balloons, yellow paint, heavy iron, cranes, hundreds of people, snow, yelling, screaming, laughing, and music, were all used to make this labor as painless as it can be. However, the pain was worthwhile and everyone that was part of this masterpiece still talk in awe of what happened that day. What made the opening more grandiose were the rhythms of Michael Buble’s Feeling Good that helped uncover this massive baby. NEWBORN unveiled. Photo by Valon Sopi. The best part of it all? 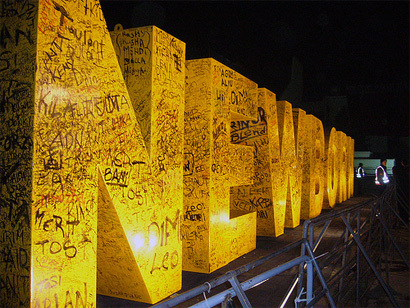 After the revelation of the NEWBORN, people with permanent markers had the chance to sign the NEWBORN as a memento that they had been there. In the parliament, the prime minister and the members of the parliament had the chance to sign the hand-written Declaration of the Independence on a 700-year-old parchment, while on the other side of downtown, the people — for whom that Independence serves — signed that same Declaration through the NEWBORN. Photo by Bashkim Hajrizi. Bigger view here. NEWBORN sits in front of the Youth Center in Prishtina. Photo by Jeton Kaqaniku. NEWBORN’s new color. Photo by Valon Sopi. In my rather short career in design I was able to be part of something that was bigger than life. Something that took all the energy out of you just so it could be given back ten-fold. Something that marks a specific time and place in the history of a country. As I’m writing this I am asking myself — “Why am I writing this post? To brag? To show-off? Or simply to share an exciting feeling of what it is like to make a piece of art for a bigger reason than just for a gallery showing and an article in a famous art magazine? !” Maybe I don’t even have the answer and I’m still searching for the century-old question “What is Art?” with the fear that I might have just found the answer. Photo by Andreas Welch. Bigger view here. Valon Sopi is a graphic designer currently living and working in Prishtina, Kosova as a lead interactive designer at Ogilvy Kosova, after 9 years of living and designing in New York and New Jersey. He holds a fine arts degree from Montclair State University, in Upper Montclair, NJ. 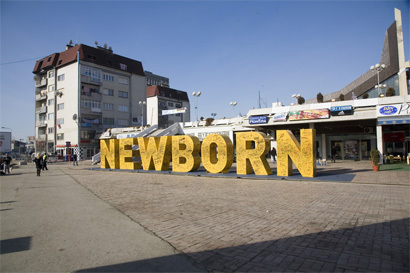 The NEWBORN Sculpture was designed and developed by the creative team at Ogilvy Kosova in Prishtina. Executive Creative Director of Ogilvy Kosova, Fisnik Ismaili led the creative team into conceptualizing, developing, and revealing the NEWBORN Sculpture. Kosova declared its much supported independence on Sunday, February 17, 2008. Roughly 2 million people inhabit this area in the southeast Europe where the median age is around 30 and rich mountains and outdoors surround an area of roughly the size of Rhode Island. For more on politics and its history visit the Wikipedia page on this article. There’s more pictures of the NEWBORN on Flickr which is closely related to the NEWBORN Blog. I'm Serbian by heritage, but Canadian born and raised, and I think this is a brilliant way to emphasize the change required in the ideology over Kosovo's independence. This is all about change, the future, and letting go of the past. Congratulations on your independence. The people behind Newborn were a mystery when I saw it in pictures on the net; thank you for sharing the story behind it. When the pictures first popped up we were discussing it over at Typophile and wondered why English was chosen as the language for the sign, would you mind explaining? Wow,congratulations,I just don't know what to say, so much emotion packed in to one piece! I couldn't have described it better! I agree that it's all about moving on and looking towards a better future. I think NEWBORN sort of works on that ideal perfectly. We had no idea it would have such an impact...up to the point where the media started to refer to Kosova as the 'newborn'. Thanks for greets. English was chosen automatically. I think it's almost visceral to think in English here (Kosova) because it is spoken quite well. The American and International presence/influence has brought about this effect. Also, we wanted to communicate the idea to the whole world and invite all to celebrate with us. NEWBORN simply was such a nice word that quickly stuck with us the moment it came up in our brainstorm. Thanks Pesky and Mark on the kind words. It's a lovely and inspiring piece. I like the fact that "Newborn" connotes not only a fresh start but also a state of untainted innocence, which will hopefully serve as something of a tonic for the Balkans which has suffered for so long. Congratulations on both your work and your independence. This is both an amazingly beautiful work of art, and an incredibly inspirational project. Fantastic! Welcome to the world of Environmental Graphic Design! Nice work. ...now comes the hard part: growing strong, protecting the innocent, staying free...you CAN do it!! Absolutely. Growing up is the hard part. Hopefully, the public expression of art will be a part of that growth. Thank you for sharing this! I absolutely agree with the growing-up part. It's all exiting now that we're born, but I hope we understand the road ahead. As any newborn we will definitively have our share of challenges ahead, but with the help of few grown-ups who've 'been there & done that' we should grow-up into a fine child, teenager, adult...and so on. I have to say that the whole NEWBORN concept has taken a toll on its own and is being used as a great metaphor for Kosova - now we just have to live up the potential. do these letter forms have their root in the NSDP? Congratulations on your – and your country’s – superb achievement. We at Montclair State are very proud of you! Thanks for sharing your new country with the world. Design can make a difference! Po me vjen shume mire qe ke marr pjese per ket design. Urime pavarsija, edhe ma merr mendja qe do te flasmi prap ndonje dite. Bravo. It looks so awesome with the tags, especially the red ones. Thanks to all for the great comments. My professor John at MSU said it best: Design can make a difference! & as simple as that sounds it really doesn't sink in until you witness someone directly being affected by design. This is one of those rare moments when I think that a piece of design really, truly has a lasting effect on me -- reading the story truly makes me emotional. I can only imagine the experience for everyone intimately close with the event.